So you’ve made a list of everything you need, as described in Goods Step One. If you’ve been thorough, it’s a pretty long list! Probably too long for practicality . . . and your budget. 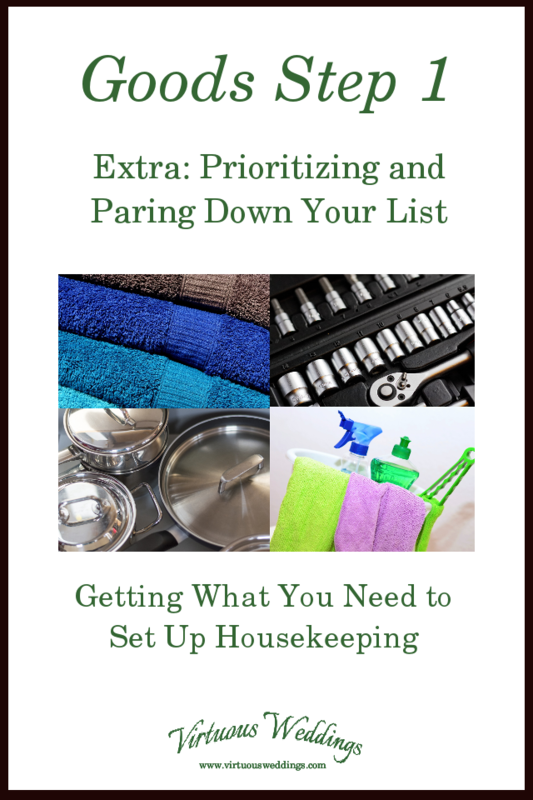 Here are some tips for paring down your list and prioritizing it so you focus on the most important things first.
. . . or another scheme along the same lines. Delete the items you don’t really need or want. If your list is painfully long, or your “must have” or “really need to have” lists seem too long, keep prioritizing until you are happy with the results. What will we use this item for? How often will we use this item? Is there some other item on our list that could do the same thing as this item? (e.g., toaster, toaster oven, and baking sheet + oven all toast bread). Is this the best item to use for our purposes? Is this more of a want or more of a need? Is it something we will need early in our homemaking or something we will need someday but not within the first year or two of our marriage? Can we do without it? For how long? How much of a hardship would that be? If we are going to have cramped quarters or many moves early in our marriage (or any time thereafter, for that matter) is this something that might be more trouble than it is worth? How sure are we that we will need this item? What will happen (or not happen) if we don’t have this item during our first year of marriage? Is the season during which we (or our wedding guests) would purchase this item the best time of year to buy it, or would we be better off waiting several months after our wedding in order to get a better deal or have a better selection? I think a spreadsheet program is the best way to manage this list because you can easily prioritize, add, or delete items, and you can organize them in any way you want to, at any time. To prioritize items in a spreadsheet, insert a column before the name of the item. Prioritize using numbers 1-9 or letters A-Z, then select all of the rows and use the “sort” feature. You can do this category-by-category, even if multiple categories are in the same list. Just “sort” items into separate categories first, then “sort” within each category.